John McNaughtonArtist John McNaughton’s painting title, ‘Crossing the swamp’ (2018). McNaughton’s paintings often go viral on the internet because of their overly flattering or demeaning depictions of political figures, like President Donald Trump and former President Barack Obama. McNaughton, while a highly skilled painter, feels he is “at odds” with the rest of the global art community. Painter Jon McNaughton’s works have drawn considerable attention online – from pro-Trump conservatives, and yes, even the art world. McNaughton’s most recent painting, titled “Crossing the Swamp,” went viral for its recasting of Emanuel Leutze’s “Washington Crossing the Delaware” with members of the Trump administration. 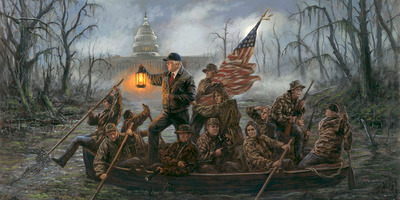 The painting depicts Trump as Washington, while paddling through a swamp outside the US Capitol building surrounded by national security adviser Jon Bolton holding a hunting rifle à la Elmer Fudd, Vice President Mike Pence holding the American flag, and Housing and Urban Development Secretary Ben Carson apparently paddling in the wrong direction. “I’ll get an initial idea and then I’ll start thinking of ways that I can put a few more layers on the onion, so to speak, and I have a lot of fun with that,” he added, noting that he will conceptualize and finish some paintings in less than a week. Christopher Knight, an art critic for The Los Angeles Times, called McNaughton’s work “junk” that missed the mark on every level. But the feelings of contempt for McNaughton’s work are not universal. He says half of America will hate his work, while the other half will love it. And it’s not just him. Justin Lieberman, an American-born, Germany-based conceptual artist, thinks highly of McNaughton and has gone as far as to start a petition to convince the State Department to nominate him to represent the US at the 2019 Venice Biennale, a prestigious art exhibit in Italy. McNaughton told Business Insider that he thinks the push for him to represent the US among the world’s elite artists in Venice is nothing more than a troll. But he did not rule anything out. If he were to be nominated, McNaughton would “of course” accept, calling it a high honour. “But I don’t expect [to be selected],” he added.